The ELLE Decor magazine profile: With fashion integrating seamlessly into home decor, the industry is going through a sea change. ELLE Decor renders this in the pages through its many sections. By profiling upcoming product designers and established names, or with pages dedicated to new materials and innovative design concepts ELLE Decor provides a keen insight into developments in the design industry. The only decor magazine in the country to forecast trends in home decor, ELLE Decor provides readers with a continuous update. With art increasingly becoming an intrinsic part of decor, the new art consumers are looking for information on art and its various mediums. In its section profiling artists, ELLE Decor unfolds art in all its creative expressions. The decor well section showcases beautiful local and international homes with strong design elements belonging to people from different walks of life. The pages are a visual delight and serve as resourceful ideas for both trade and consumers. To provide a complete spectrum on home-related information, ELLE Decor researches a single area of the home in the focus section. From showcasing different styles appealing to different design sensibilities to familiarizing the reader with sound tips and technical jargon in the blue pages, the section provides detailed inputs and enjoys high retention value. Reaching out to a lifestyle conscious audience, the ELLE DeCOR reader is a discerning consumer. With a keen sense of design and fine living, the reader enjoys high inspirational levels and makes independent decisions on maintaining a certain standard of living. 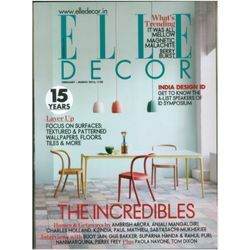 Whether its entertaining often or doing up the home in a stylish manner, the ELLE Decor consumer is a fashionable person who keeps abreast of the latest trends and styles prevalent in homes and interiors; and is constantly looking to enhance the home environment by imbibing these trends. ELLE Decor as a design expert unveils limitless opportunities in the design arena.